it would be in a setting like THIS one shown above! 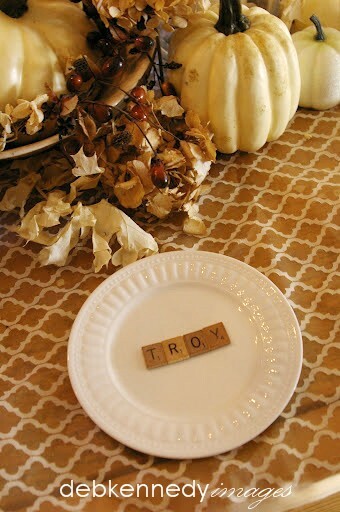 what a delightful way to create a memorable autumn event. 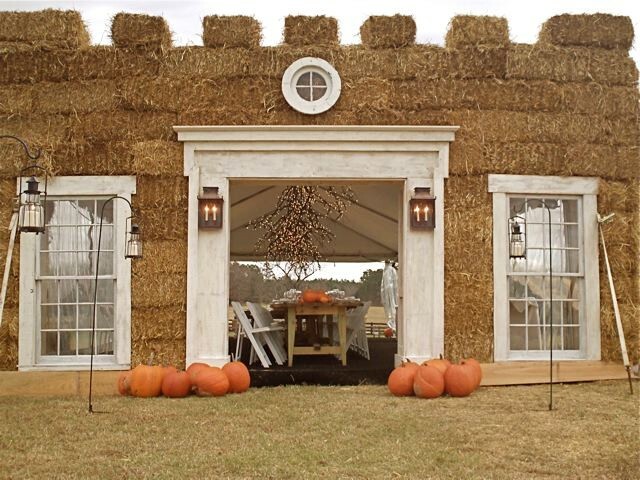 this is a wall built with straw bales that fronts a party tent. brilliant. can't you just picture this at dusk, with candles glowing and soft music playing? let's get back to the real world of trying to fit decorating into our already busy schedules! one thanksgiving arrived and i had been so busy at work that i forgot about the table decor. that sounds completely AWFUL, doesn't it??? well, life happens sometimes... we've all been there. *used a fabric scarf - very large, almost sari-like -as the tablecloth. it allowed the golden wood of the table to show, and created a garden lattice effect. bleached leaves, and dried hydrangeas right from the yard. to spell out the name of the guest who would be sitting there. the little plate above was for my sweet almost two year old grandson. *folded a white linen tablecloth and used it as a runner. 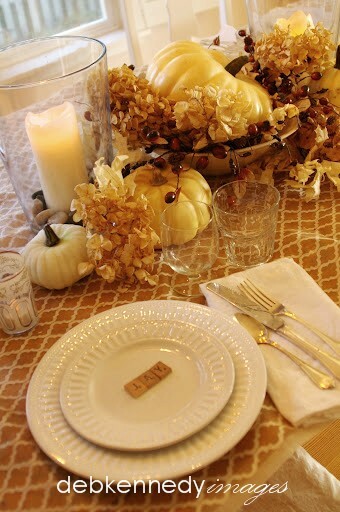 *scattered some bleached leaves and votive cups with tealights in them down the runner. *set placesettings with my white dinnerware, linen napkins, glassware, and silver. it only took me about FIFTEEN MINUTES to do this whole thing! it just WHISPERED it instead of shouting. (and instead of last-minute fretting, fussing and foofing of the table,. i was sitting in a chair with a glass of wine, visiting with my daughters and grandsons. I would officially like to invite you to Thanksgiving....all you need to bring is the decor!!! Wonderful ideas as usual Deb!